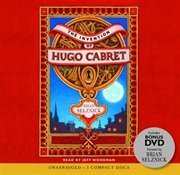 I read, loved, and reviewed The Invention of Hugo Cabret earlier this month. I’m not going to talk about the book itself again here. Instead, I want to talk about the audio production of Hugo Cabret. For those who have read it, the idea of an audio production might seem strange – the book is half pictures! How does one change pictures into audio format? But indeed an audio version exists. Shelley first mentioned it to me and told me a little about it. Then Aarti sent me a link to a youtube video where Brian Selznick explains how they translated the artwork to audio. According to the youtube video, picture sequences were converted into sound, so that a listener could follow the story that way. The sounds created the pictures in your mind, the way they might have in an old radio program. That sounded fascinating, so I knew I had to try it out. I checked the audiobook out from the library and listened to it over a couple days. I listened to Part I while looking at the book, and to Part II without looking. There were a lot of interesting vocal and sound tricks too. Whenever someone would enter the bookstore, a bell would ring. When they’re at the ceremony at the end of the book, the announcer’s voice is magnified and distorted as though talking through a microphone in a large room. In a way, the sounds really enhanced the audiobook and made it more than just an audiobook, the way the pictures made the book more than just a book. The reader, Jeff Woodman, did a good job reading. Each of the characters was distinguishable by voice and vocal mannerisms, so I never got confused who was speaking, and the inflections indicated emotion well. On the whole, I have to say I prefer the book to the audiobook, simply because I love the visual quality of it and I prefer books to audio in general. I’m impressed, though, with the way this unique book was handled, the way it became a very unique audio production as well. This entry was posted in 2010, Children's, Visual and tagged audio, callback, favorite, historical, memorable, reread. Bookmark the permalink.